I love films that take a very intimate, up-close look at another way of life. You can’t get much closer than the macrophotography on display in MICROCOSMOS, which is showing for free – yes, FREE – at the Silver Outdoor Plaza on Tuesday, June 22, at 9:30pm. And you won’t find a more different life than the subjects of this “ethnographic” film: the ants, aphids, ladybugs, and assorted insects who live all around us–in a completely different world . The original French version was subtitled, “The Grass People;” it is completely shot from their perspective and often at their eye level which results in some amazing shots. Watch the trailer for a sample of the fantastic camera work. Keep your eye out (at 38 seconds) for the poor ladybug whose leaf gets turned into a trampoline by a falling rain drop! Roger Ebert called it “a work of art and whimsy as much as one of science” in his review, and the trailer makes it clear that it will be a unique experience. 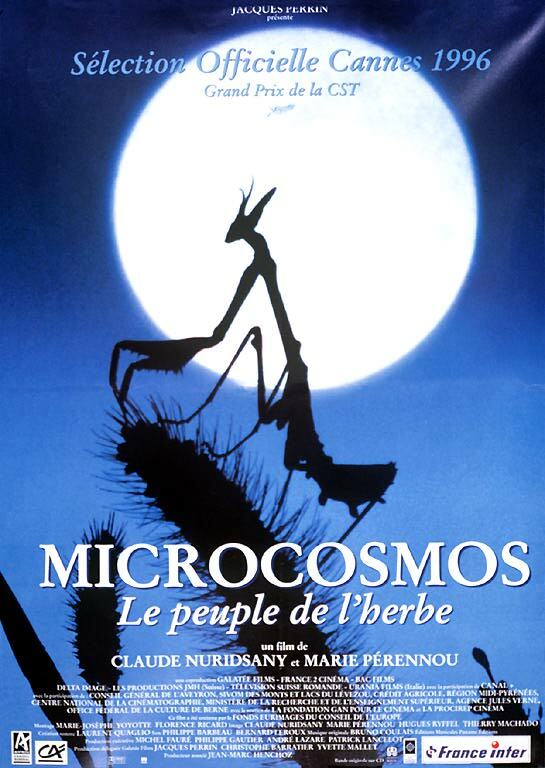 I’ve been wanting to see MICROCOSMOS for almost a decade (it was released in 1997). When my nieces were young, they watched it over and over on VHS. It will be great to see outside on the big screen. One further intriguing piece of information. The producer, Jacques Perrin, is no stranger to natural history documentary, having produced WINGED MIGRATION and OCEANS. But I was surprised to learn that he produced the classic political thriller, Z, directed by Costa-Gavras, as well as acted the part of the young photo-journalist. FREE – at the Silver Outdoor Plaza on Tuesday, June 22, at 9:30pm. –Matthew Radcliff is a member of the SilverDocs screening committee and the organizer of the WIFV Documentary Roundtable. This entry was posted in Uncategorized and tagged afi, afi silver, discovery channel, documentary, macrophotography, nature films, silver spring. Bookmark the permalink.